There are a lot of options for Event Organizers to sell sponsorships within the Jujama platform. Several of our customers have packaged combinations of these options to sell to sponsors to help fund their events. We thought we’d take a few moments to outline just a few of these options. From within the Jujama mobile and desktop apps a list of Sponsors, and their Sponsor level, can be shown to attendees that would like to gather more information about the sponsors of the event they are attending. A complete Sponsor Bio can be built including logo, web site, thorough description, and much more. Even the Sponsor’s personnel that may be on hand at the event can be listed. At many conferences the Social Feed is where the action is. This page will be loaded and engaged with several times per day by all attendees. Sponsored posts can be crafted and either show inline with other posts, or be made “sticky” so that they stay at the top of the feed for a duration of time. Several of our customers choose to carefully curate their sponsored posts within the Social Feed to have certain posts from Sponsors show at different times throughout the day – perhaps showcasing sponsors that are relevant to the current activity or session that may be happening at the event. Sponsors can also be encouraged to post to the Social Feed themselves, sharing links, photos, hashtags, or their own Sponsored sessions for attendees to check out. Using the Social Feed in combination with other Sponsorship opportunities that Jujama provides really gives the Conference Organizer limitless possibilities to help their Sponsors get a return. 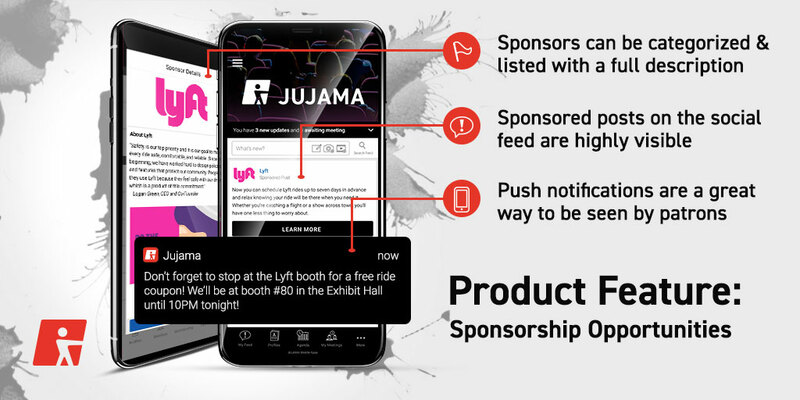 For attendees that choose to allow Push Notifications to their mobile devices, the Jujama platform can be used to provide valuable Sponsor-related messaging through Push Notifications. Perhaps attendees need to be notified of a change in schedule, of a meal being served, of free drinks at the bar, or of some other time-sensitive piece of information… using Push Notifications the Conference Organizer can quickly spread the word. Why not allow a Sponsor to either have those messages be branded or perhaps a timely message from the Sponsor themselves could be coordinated? The number of ways that Sponsorship opportunities can be crafted to help events provide real value to their Sponsors is nearly endless. If you’d like to know more about how this might work for your event, be sure to request a demo and mention that you’d like to know more about these features.